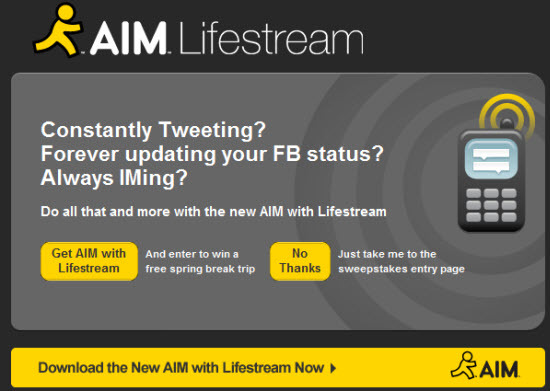 AOL has really been pushing their Lifestreaming efforts and has now upped the ante by tempting users with a free trip. They’ve created a custom domain and landing page for users to enter the sweepstakes. The download and installation of the AIM 7.1 client with Lifsetreaming is not a requirement to enter. GRAND PRIZE: One (1) Grand Prize Winner will receive a trip for four (4) to Grand Prize Winner’s destination of choice. The Grand Prize includes: i) four (4) roundtrip coach-class airfare for Grand Prize Winner and three (3) guests between a major metropolitan city airport in the US closest to the Grand Prize Winner’s residence and Grand Prize Winner’s chosen destination, and ii) hotel accommodations (one (1) standard room) at a hotel selected by Grand Prize Winner . Grand Prize winner will be able to choose their destination, hotel, and length of stay; however, the amount that will be awarded towards the retail purchase price of the Grand Prize trip will be no more than $3,900. Grand Prize will not exceed the total ARV value of $3,900. ARV may vary based upon Grand Prize Winner’s chosen destination, hotel accommodations, and length of stay, not to exceed a maximum of $3,900. Grand Prize Winner will be responsible for any cost above $3,900. Total Approximate Retail Value of the Grand Prize is $3,900. So I guess you can spend spring break wherever $3900 will take you.